Resight Inclusive Arts (RIA) is a charitable organization which provides arts training, education and employment for persons with disabilities. We encourage a more diverse arts community in Hamilton. 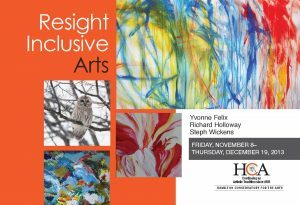 Resight Inclusive Arts is operated by accomplished award winning artists living with barriers. We aim to provide resources to individuals whose situations traditionally make it difficult or impossible to experience the world of art. We base our vision on equality and provide the tools for education and self advocacy. Resight Inclusive Art is open to everyone.